The Alpha Course is a series of sessions exploring the Christian Faith. All around the globe people are joining the conversation. At each session, we gather together to dine, enjoy a presentation surrounding a common question surrounding Faith, and then share and discuss the presentation over dessert and coffee. The St. Pius X Alpha Course is the Catholic application of the program with a focus on the Roman Catholic faith and anyone is welcome. No two Alpha Course groups look the same, but generally have three key components in common: food, talk and great conversation! 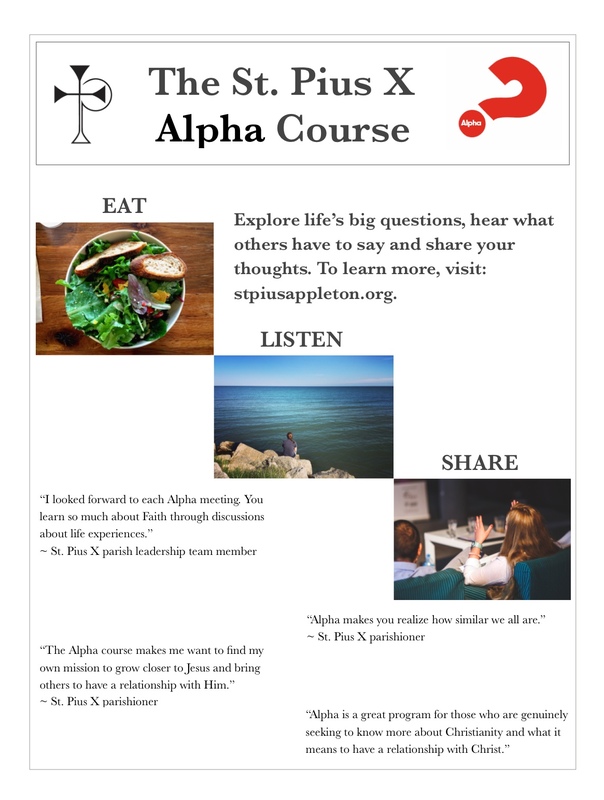 Check the website for information about the upcoming Alpha Course starting in September. Sundays, 9:45 a.m. - 11:30 a.m. Session 2 - Sept. 30 Who Is Jesus? Session 3 - Oct. 7 Why Did Jesus Die? Session 4 - Oct. 14 How Can I Have Faith? Session 5 - Oct. 21 Why and How Do I Pray? Session 6 - Oct. 28 Why and How Do I Read the Bible? Session 7 - Nov. 4 How Does God Guide Us? Session 8 - Nov. 10 Who is the Holy Spirit? Session 9 - Nov. 10 What Does the Holy Spirit Do? Session 10 - Nov. 10 How Can I Be Filled With the Holy Spirit? Session 11 - Nov. 10 How Can I Make the Most of the Rest of My Life? Session 12 - Nov. 18 How Can I Resist Evil? Session 13 - Nov. 25 Why and How Should I Tell Others? Session 14 - Dec. 2 Does God Heal Today? Session 15 - Dec. 9 What About the Church?  Tuesdays, 6:00 p.m. - 8:15 p.m. Session 2 - Oct. 2 Who Is Jesus? Session 12 - Nov. 20 How Can I Resist Evil? Session 13 - Nov. 27 Why and How Should I Tell Others? Session 14 - Dec. 4 Does God Heal Today? Session 15 - Dec. 11 What About the Church? Fridays, 8:45 a.m. - 10:30 a.m. Session 2 - Sept. 28 Who Is Jesus? Session 3 - Oct. 5 Why Did Jesus Die? Session 4 - Oct. 12 How Can I Have Faith? Session 5 - Oct. 19 Why and How Do I Pray? Session 6 - Oct. 26 Why and How Do I Read the Bible? Session 7 - Nov. 2 How Does God Guide Us? Session 12 - Nov. 16 How Can I Resist Evil? Session 13 - Nov. 30 Why and How Should I Tell Others? Session 14 - Dec. 7 Does God Heal Today? Session 15 - Dec. 14 What About the Church?